This is a memory map covering my ‘formative years’ I suppose you would call them (1973 – 1993). 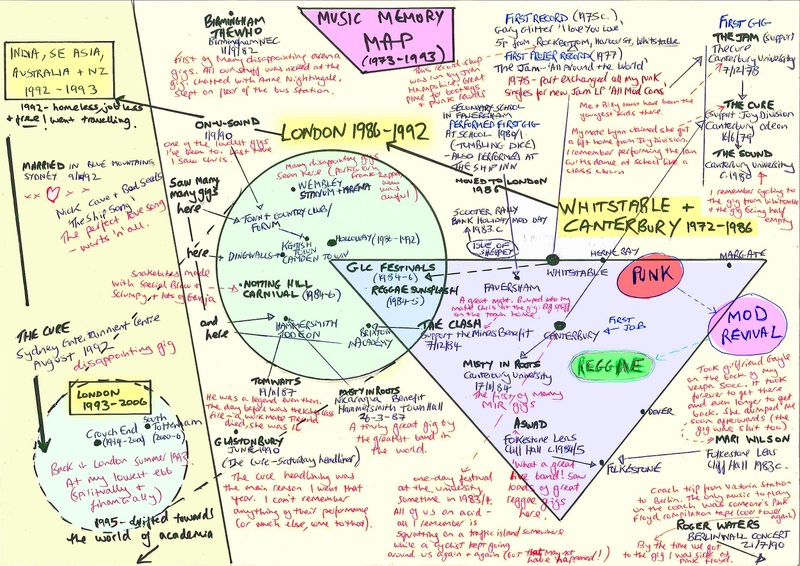 I found it quite difficult at first to determine exactly how to approach the task of mapping my early music memories. In retrospect it now seems obvious, but it only started to work when I learnt to be guided just by what more immediately presented itself as a memory. This was overwhelmingly focused around live music performance; in particular those that involved significant or memorable journeys. In most cases what I found to be memorable were little snippets of details related to specific gigs, but not necessarily the performance or performer. In some cases the gigs remembered weren’t even ones I particularly enjoyed. The other pattern that started to emerge was the geographical clusters of music memory. I’ve represented these by a triangle for Kent (where I grew up) which overlaps with a circle representing London. The overlapping is important because, whereas journeys had hitherto been mainly to Canterbury or Folkestone to see gigs, around 1983/4 I made regularly trips with friends to the capital for gigs, but also for major music events such as the GLC festivals of which there were many (until Thatcher pulled the plug on London local government in 1986), and the Notting Hill Carnival. The overlapping also represents a time of transition as, by 1986, I had moved to London and whole new world of music and live performance opened itself up to me. What is represented on the map is of course only a small selection of what could otherwise be included if time and space permitted.